The Dengue NS1 Ag-IgG/IgM Combo Test is a rapid chromatographic immunoassay for the qualitative detection of antibodies (IgG and IgM) and dengue virus NS1 antigen to dengue virus in Whole Blood /Serum / Plasma to aid in the diagnosis of Dengue viral infection. Dengue is transmitted by the bite of an Aedes mosquito infected with any one of the four dengue viruses. It occurs in tropical and sub-tropical areas of the world. Symptoms appear 3—14 days after the infective bite. Dengue fever is a febrile illness that affects infants, young children and adults. Dengue haemorrhagic fever (fever, abdominal pain, vomiting, bleeding) is a potentially lethal complication, affecting mainly children. Early clinical diagnosis and careful clinical management by experienced physicians and nurses increase survival of patients. Dengue NS1 Ag-IgG/IgM Combo Test is a simple, visual qualitative test that detects dengue virus antibodies and dengue virus NS1 antigen in human Whole Blood/serum/plasma. The test is based on immunochromatography and can give a result within 15 minutes. The Dengue NS1 Ag-IgG/IgM Combo Test is a qualitative membrane strip based immunoassay for the detection of dengue virus antibodies (IgG and IgM) and dengue virus NS1 antigen in Whole Blood /Serum / Plasma. For IgG/IgM Test :The test device consists of: 1) a burgundy colored conjugate pad containing dengue recombinant envelope antigens conjugated with Colloid gold (dengue conjugates), 2) a nitrocellulose membrane strip containing two test lines (T1 and T2 lines) and a control line (C line). The T1 line is pre-coated with the antibody for the detection of IgM anti-dengue, T2 line is coated with antibody for the detection of IgG anti-dengue. When an adequate volume of test specimen is dispensed into the sample well of the test cassette, the specimen migrates by capillary action across the cassette. 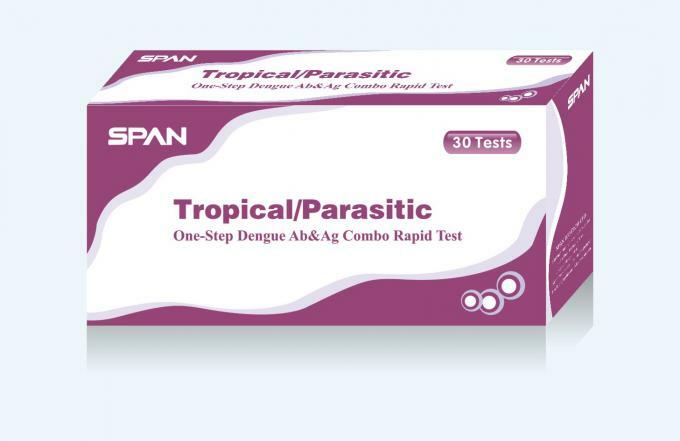 IgG anti-dengue, if present in the specimen, will bind to the dengue conjugates. The immunocomplex is then captured by the reagent pre-coated on the T2 band, forming a burgundy colored T2 line, indicating a dengue IgG positive test result and suggesting a recent or repeat infection. IgM anti-dengue if present in the specimen will bind to the dengue conjugates. The immunocomplex is then captured by the reagent coated on the T1 line, forming a burgundy colored T1 line, indicating a dengue IgM positive test result and suggesting a fresh infection. Absence of any T lines (T1 and T2) suggests a negative result. For NS1 Test: In this test procedure, anti-Dengue NS1 antibody is immobilized in the test line region of the cassette. After a Whole Blood /Serum / Plasma specimen is placed in the specimen well, it reacts with anti-Dengue NS1 antibody coated particles that have been applied to the specimen pad. This mixture migrates chromatographically along the length of the test strip and interacts with the immobilized anti-Dengue NS1 antibody. If the specimen contains dengue virus NS1 antigen, a colored line will appear in the test line region indicating a positive result. If the specimen does not contain dengue virus NS1 antigen, a colored line will not appear in this region indicating a negative result. To serve as a procedural control, a colored line will always appear at the control line region indicating that proper volume of specimen has been added and membrane wicking has occurred. Store as packaged in the sealed pouch at room temperature or refrigerated (4-30℃ or 40-86℉). The test device is stable through the expiration date printed on the sealed pouch. The test must remain in the sealed pouch until use.